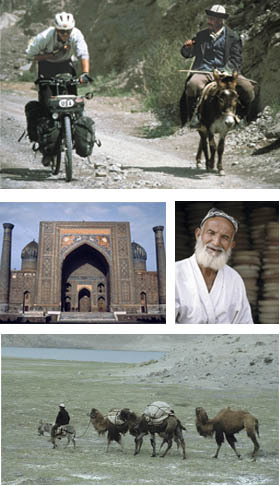 In 1992, just after the collapse of The Soviet Union, adventure cyclist, Steve Williams, as part of a group of five Americans and two Russians, set out to traverse The Silk Road by mountain bike. 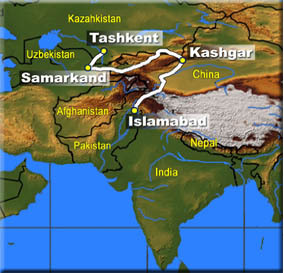 The isolated and remote area of Central Asia is just to the north of Afghanistan and includes the rugged Pamir and Tien Shan Mountains. This section of The Silk Road was traversed by traders and travelers for centuries, but had been closed to outside travelers for nearly 70 years. Steve and his group would be the first adventurers to bicycle through this region without the constraints of soviet bureaucracy. Sharing camps with nomadic herders, experiencing Soviet style distribution (one village would have all the light bulbs and another, 300 KM away, would have all the fixtures) and communicating with their Russian-only speaking companions through nightly songfests and liberal quantities of “translation fluid” (i.e. cheap Russian vodka,) are just a few of the episodes that Steve shares in his illustrated adventure program that brings this amazing expedition to life.